Does Dual Nature work with Opalescence? 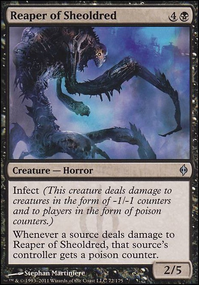 Does proliferate effect errata, the silencer’s exile counters? Before I proceed with some suggestions I just need to note that Shield of the Oversoul isn't legal in this deck. 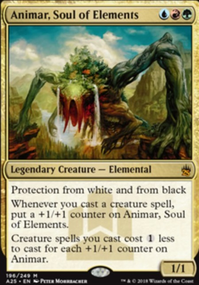 Cards with hybrid mana symbols have the color identity of both, so that's considered a white card as well as a green card. I'd definitely add Ezuri, Claw of Progress . You may want to keep Primordial Hydra but Kalonian Hydra is another solid add. 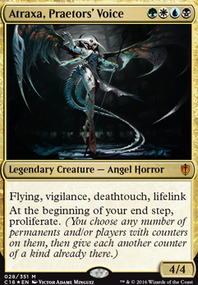 Since you can proliferate divinity counters Myojin of Life's Web is a powerful card and the high cmc means you'll be able to cast almost anything it gets with a Rashmi trigger. Vigor is cheap so I think it's an auto-include in counters decks honestly. I've used Nissa, Voice of Zendikar to great effect in my counters deck and even managed to ultimate her. Inspiring Call is a good way to draw cards and make sure you can attack with a horde of creatures without getting them board wiped. I'd definitely consider adding Inexorable Tide which would fit nicely in the slot of Shield of the Oversoul . 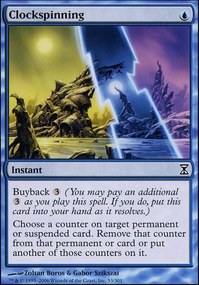 Lastly you could think about Crystalline Crawler , Tezzeret's Gambit and Gilder Bairn . I guess my only other suggestion would be to keep an eye on the new cards with proliferate coming in War of the Spark. Inexorable Tide and Chasm Skulker may fit here. 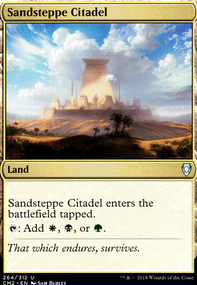 Also Mirror Match would be crazy if attacked with a swarm and your commander on the field. Also, I looked at your list. Is it supposed to be only 24 cards...?